engines roared, cars shook, while passengers viewed layered rolling murals that accentuated the depth of the Russian countryside such as: Irkoutsk and Manchuria. Invisible blowers shot Russian air at the passengers to heightened the motion and reality. 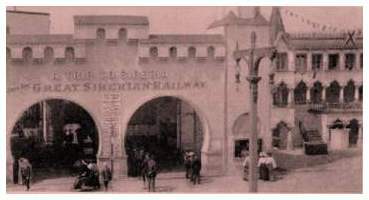 `Stops’ were made in various cities where passengers could disembark and mingle with Russian actors. 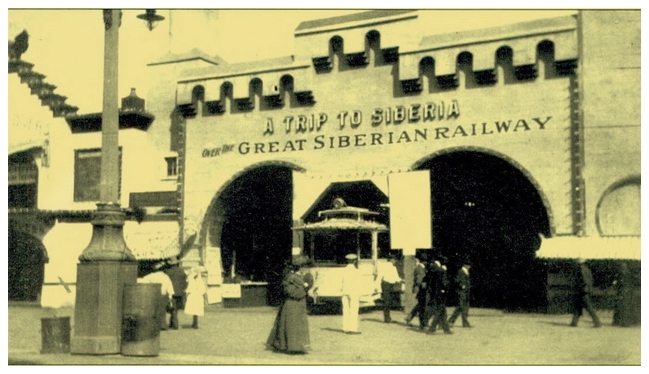 Upon the final stop, passengers would get off and for an additional 10 cents, visit a Russian Village. There, actors performed a wedding ceremony and showcased local music. Featured was a popular performance by the Russian Dance Troupe of 40 persons (for an additional charge).